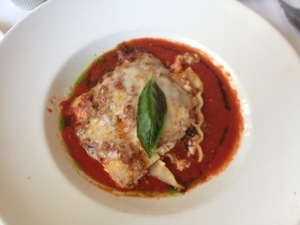 Italian food can be tricky, it can be un-flavorful, heavy, & and a flat out waste of of calories. But then one day you come across some italian food that is the complete opposite; one that makes you smile, one that doesn’t make you have to unbutton your pants at the table, and pull your shirt down over your unzipped area so know one sees, and that kind of experience you can definitely have at “Isabella’s” in Manhattan, New York. When I was little I liked lasagna, but I was never to keen on ricotta cheese and I still feel the same way today, and although I like lasagna I always turn away for this reason, but often times taste buds mature or should I say change, so opting not to rely on tastebud recall, I ordered the lasagna with “bolognese, basil, parmesan, & fresh mozzarella” now the menu did not mention but the ingredients went further to include a bechamel sauce, simply with the purpose of making me grin with glee. This lasagna was light, the bolognese was well seasoned, the ricotta was positively under bearing, but the mozzarella with its distinctive taste of saltiness had a little bit crisp from being placed under the broiler which landed this lasagna to the top of the food charts. The goodness doesn’t not stop there, I proceeded to the “house made rigatoni pasta” with shrimp, sweet peppers, asparagus, & lemon. 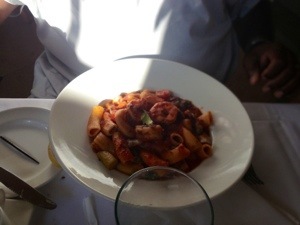 The shrimp was spicy the rigatoni was cooked to perfection, the peppers sweet, & the asparagus cooked with a slight crunch in tact. 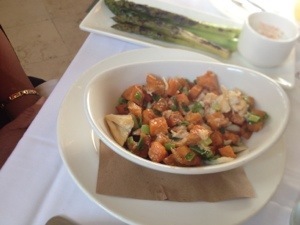 I always love ordering things on the menu that when you read the ingredients not only can you not make heads or tails what the dish will look like, but you simply dont know what the devil the chef is talking about…and the “maryland crab hash” definitely fit the bill. Whenever I think of hash I think of shredded pan fried potatoes, not cubed sweet potatoes, I also think of some type of canned beef or other foreign meat, not maryland crab, also I think of just simply salt & pepper for seasoning, not chives and green onions. Lastly I also dont think absolutely delightful is synonymous with hash. A new twist on an old concept was absolutely sublime. 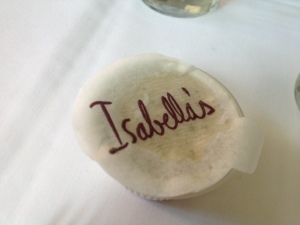 I would say eating at Isabella’s was as delightful as watching Miley Cyrus twerk, I mean you probably should turn away and not watch, but then you realize it is just good clean fun so you proceed with joy.